Over time, your teeth darken as colourants penetrate the outer enamel layer. This darkening can be caused by foods and beverages that stain, such as coffee, colas, tea, red wine or berries. Tobacco products, like cigarettes, cigars and chewing tobacco, can cause teeth to take on a yellowish brown hue. And the natural ageing process can also cause your teeth to darken. We can prescribe a whitening system, that will safely lighten these stains, giving you a whiter, brighter smile! A specially formulated whitening gel, designed to be highly effective, yet safe, gently forces oxygen through the enamel of your teeth. The process virtually erases stains and brightens your teeth, without damaging your tooth enamel or your gums. New breakthroughs in light-activated gels and high- intensity lights now make it possible to achieve a whiter, brighter smile — right here in our office. First, we thoroughly remove any plaque and tartar from your teeth. A special protective material is then applied to your gum to form a barrier and isolate the teeth to be whitened. 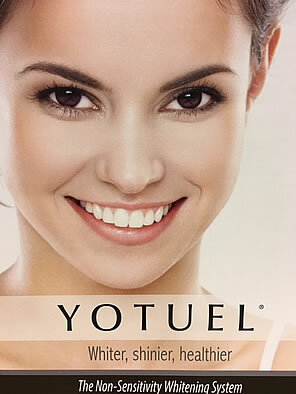 A whitening gel is applied to the teeth and activated by a high intensity light or laser. After some time the gel is rinsed off and the process may be repeated according to your individual need. Since every case is different, we carefully evaluate your individual results. We sometimes recommend additional bleaching at home or another session here in our office. First, we thoroughly examine your teeth and your mouth to make sure at-home whitening is an appropriate option for you. We then take impressions of your teeth, and use the impressions to make models of your teeth. Using these models, we make a personalized whitening tray that fits tightly over your teeth, allowing us to achieve optimum results. At home, you'll fill the tray with the whitening gel and place the tray over your teeth, keeping it in place for several hours each day. You can wear the whitening trays while you sleep, or if you prefer, you can wear them as you go about your day. Typically, you'll begin to see results in two to three weeks. We'll monitor your progress on a regular basis, ensuring that your gums aren't becoming irritated and your teeth are whitening as desired. When the process is complete, your smile will be noticeably whiter and brighter! Let us know if you experience some sensitivity during or following the whitening process; this is normal, and should subside shortly. We can suggest toothpaste that will alleviate the sensitivity.